Bengaluru, Karnataka, India – Before His Holiness the Dalai Lama went out this morning, filmmaker Bharath Subbarao and his wife Soumya introduced him to ‘Mandala’, a newly launched app dedicated to bringing Buddhist wisdom and the best insights of psychology together in a clear and accessible way so that people may apply them in their everyday lives. The app is introduced and guided by Thupten Jinpa, a former Buddhist monk who completed his training as a Geshe Lharampa at Ganden Monastery and went on to earn a BA in philosophy and a PhD in religious studies at Cambridge University. 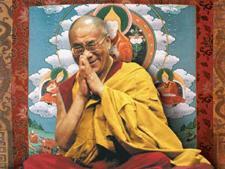 He has served His Holiness extensively as a translator since 1985 and has translated and edited numerous books by him. The app, which is presently available in English, French, Spanish, Russian and Chinese, offers talks and conversations that bring together Buddhist wisdom and scientific insights under the heading Learn. Well-known scientists and writers like Daniel Goleman contribute. Under the heading Live, are a series of guided meditation practices, while there is also an option to discover and delve further into key Buddhist concepts under the heading Explore. His Holiness was pleased to see that guidelines to help people find peace of mind and develop a warm heart could be made so easily and clearly available to them. A short drive brought His Holiness to the King’s Court section of the Palace Ground. A spellbound crowd of more than 2500, mostly young Tibetan students, but also including about 300 Bhutanese and others from the Himalayan Region waited to listen to him. All expenses for the event were met by Ganden Jangtse Monastery. Received by Chief Representative Chophel Thupten, His Holiness was given a traditional welcome at the door. Inside the hall, a group of singers and musicians performed for him. He beamed with pleasure as they played. Chophel Thupten presented a brief report of achievements and aspirations for the future, before requesting His Holiness to address the gathering. “I’ve been busy visiting the settlements here in Karnataka,” he told them. “I caught a cold which left me feeling tired, but now I’m here in Bengaluru and very happy to meet you all. “Tibetans faced great hardship in their own land. However much we tried to accommodate ourselves to the problems that arose, we were ultimately unable to reconcile the conflicts we encountered and fled instead into exile. Indian Prime Minister Nehru took great personal responsibility for helping Tibetans. I met him first in Peking in 1954, then again in India in 1956, before coming into exile in 1959. At his instigation the Government of India did whatever it could to help us. Here in Karnataka, Chief Minister Nijalingappa went out of his way to offer us support. “Tibetans in Tibet have an undaunted spirit and an unswerving devotion to our religion and culture. Wherever we’ve ended up in the world, whether it’s in India, Europe, the USA, Canada, or Australia, we haven’t forgotten that we are Tibetans. It’s in our blood. The 150,000 Tibetans who live freely in exile are a source of hope to their brothers and sisters in Tibet. We have been successful in keeping our heritage alive. Since we came into exile, many people who weren’t acquainted with them before have taken interest in our religion and culture. Scientists in particular are taking a growing interest in what we know about the mind. “In the past, study of philosophy and logic, as well as learning about the mind, were largely the preserve of monks in the centres of learning. It wasn’t something people in the ritual monasteries or nunneries paid attention to. However, in exile monks in those monasteries and nuns in their nunneries have taken up the study of logic and philosophy. Throughout the Himalayan Region from Ladakh to Arunachal Pradesh lay people too are becoming 21st century Buddhists by studying what Buddhism is about. “How many of you can recite the ‘Heart Sutra’ from memory? The main thrust of the teaching is emptiness. It shows that things exist in dependence on other factors, therefore they don’t have any independent existence of their own. Experts in quantum physics have told me that what are new insights for them today find resonance in what Nagarjuna wrote about dependent arising long ago. His Holiness explained that as far as political affairs are concerned, he has retired. He semi-retired after the leadership election in 2001 and fully retired after the election of 2011. He recalled Nehru advising him that the USA was never going to go to war with China over Tibet. Subsequently, in 1974 it was decided not to seek independence for Tibet, nor to make further appeals to the UN. Nehru stressed that sooner of later we would have to negotiate with the Chinese authorities. The Chinese constitution includes provisions for the autonomy of Tibet, which should be implemented. Tibetans in Central Tibet, Kham and Amdo need to be able to protect their identity and culture. His Holiness pointed out that the Middle Way Approach developed once Deng Xiaoping began to relax restrictions and expressed a willingness to talk. After the craziness of the ‘cultural revolution’, he hoped that common sense would prevail. His Holiness remarked that the undaunted and unwavering spirit of Tibetans in Tibet and the efforts of those in exile have ensured that the Tibet issue is not forgotten. He reiterated the necessity of keeping Tibetan culture and language alive. His Holiness lamented the huge loss of life in war over the last century and that violence is still going on. He observed that when Mahatma Gandhi put engaged in ahimsa, non-violent resistance his opponents regarded it as a sign of weakness. And yet in the end he was successful. His Holiness told the students that he is convinced that if ancient Indian knowledge of the workings of the mind and emotions can be combined with modern education, it will make a significant contribution towards peace in the world. In answering questions from the audience he advised that death is a natural process and that everyone who’s born will die. What can help at that moment is to have a peaceful state of mind and a warm heart. He stated that women can become religious leaders and mentioned the examples of Shugseb Jetsun and Samdhing Dorje Phagmo. He added that after pursuing a rigorous program of study, 20 nuns were last year awarded the first Geshe-ma degrees. A girl from Ladakh acknowledged that His Holiness regularly refers to himself as a simple Buddhist monk, but Tibetans and Himalayan people also know him as Chenrezig. She asked if he had anything to say about that. “This year in Ladakh, a young girl asked me straight out, ‘Are you a God?’ and I told her ‘No’,” His Holiness reported, laughing. “The First Dalai Lama, Gendun Drup had visions of Avalokiteshvara and Tara and the Dalai Lamas from the 2nd until the 13th all had visions. I was born in a very remote village near Kumbum Monastery in Amdo. The search party was sent there as a result of visions the Regent saw in the surface of Lhamo Latso Lake, a lake activated by Gendun Gyatso, so you might say this Dalai Lama was recognised by Palden Lhamo. I have a strong karmic connection to the previous Dalai Lamas, so she helps me. “I’ve had several dreams indicative of the past. In one I had been held as a prisoner in ancient Egypt and was released by order of the Pharoh. I’ve also had dreams indicative of my close connection to the Indian adept Krishnacharya and to the founder of Drepung Monastery Jamyang Chöjey. His Holiness gave transmission of the mantras of Buddha Shakyamuni, Avalokiteshvara, Manjushri and Arya Tara, as well as the four line verse for taking refuge in Buddha, Dharma and Sangha and generating the awakening mind. In a final piece of advice he asked the young people to help others if they can, but if they can’t, that to avoid doing them any harm.